Would you believe it that this kitchen used to be in a completely different location? The kitchen actually used to be located near the garage door, we decided to move it to offer more space and functionality. 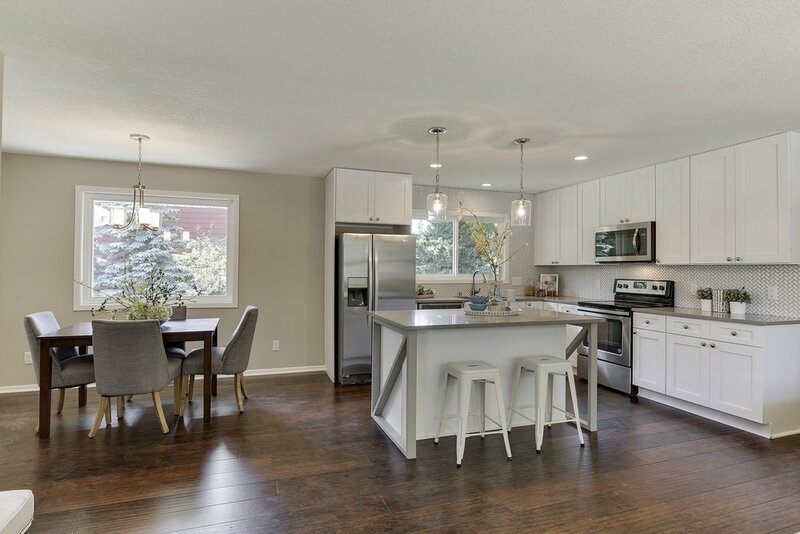 The layout is updated with a large kitchen island that offers seating and plenty of space in the walkways for entertaining. 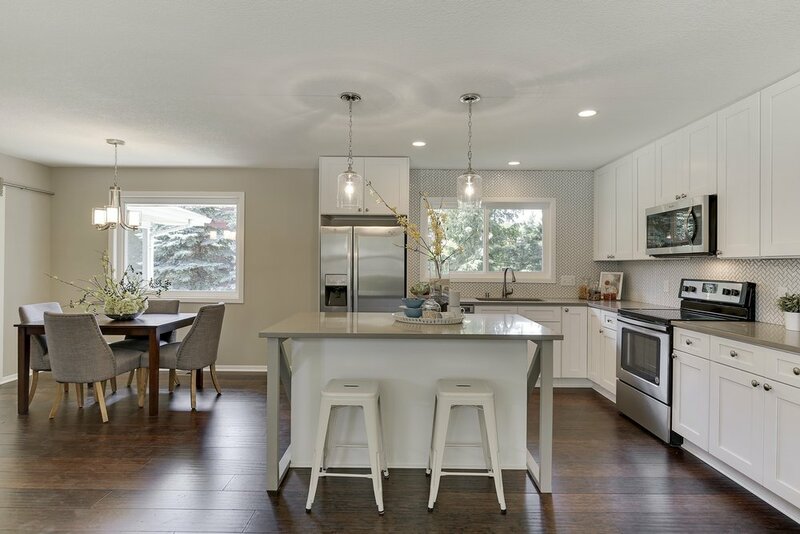 We chose warm grays for the paint colors, countertops, and the grout color to keep it feeling cozy. Below we talk about the elements we used in this design! Want to see the stunning before and after? Click on our Work page and scroll down to "10th Ave SW". These beautiful pendant lights hang from a chain with a polished nickel finish and beautiful clear glass shades! We used a white ceramic herringbone mosaic tile for the backsplash. A grey grout to match the color of the countertops helped to showcase the herringbone shape. These super cool white industrial barstools added the perfect amount of edgy style to the space. This dark stained hardwood added warmth to the white and gray space. Shaker cabinets are classic and stylish! White keeps everything looking bright and spacious. We love to find hardware that looks a little more contemporary while still being classic. We chose a round knob in a brushed nickel. We used our favorite undermount single basin stainless steel sink for a lot of space to wash dishes and prep food. We like to install faucets with a single hole because they are easy to clean around. The pull down sprayer also makes dishes and food prep easier in a large sink. We chose a Whirlpool appliance package with side-by-side fridge, over the range microwave and an electric range. We chose a warm gray quartz countertop for a neutral and durable choice that will stay looking great for years to come.